We are pleased to announce that our two latest volumes in the series are now published. Follow the links for further information. Both volumes are now available via Bloomsbury in both hardback and ebook formats. "... building on the extraordinary achievements of the Ancient Commentators on Aristotle project, AR is a valuable collection of groundbreaking studies, which, together with AT, constitutes a must-read for any scholar and student of philosophy and Classics"
The bibliography of work on the Ancient Commentators has now been updated and includes material up to 2016. It is available here, alongside two earlier bibliographies. We hope that between them they give fairly full coverage of the scholarly literature. We also have a new bibliographical guide to the commentary tradition in Greek, Syriac, and Arabic philosophy, arranged chronologically from Andronicus to Averroes (available on the same page). We welcome any corrections, additions, reports of typos, and so on, which can be sent to aca@kcl.ac.uk. We are pleased to announce the publication of the first of four volumes due out this year: Olympiodorus, On Plato First Alcibiades 10-28, by Michael Griffin. Three further volumes are all now in proof stage and will be published over the Summer. For further details see the Spring 2016 Newsletter, available here. We are pleased to note a recent critical review entitled ‘Philoponus and His Development: Four Recent Translations on Nature, Knowledge, and the Physical World’ in The International Journal of the Platonic Tradition 9 (2015), 89-98, by Gary Gabor [DOI: 10.1163/18725473-12341302]. Forthcoming in 2016: a new edition of Richard Sorabji’s Aristotle Transformed, with a new introduction: Aristotle Transformed: The Ancient Commentators and Their Influence. This book brings together twenty articles giving a comprehensive view of the work of the Aristotelian commentators. First published in 1990, the collection is now brought up to date with a new introduction by Richard Sorabji. New generations of scholars will benefit from this reissuing of classic essays, including seminal works by major scholars, and the volume gives a comprehensive background to the work of the project on the Ancient Commentators on Aristotle, which has published 100 volumes of translations since 1987 and has disseminated these crucial texts to scholars worldwide. The importance of the commentators is partly that they represent the thought and classroom teaching of the Aristotelian and Neoplatonist schools and partly that they provide a panorama of a thousand years of ancient Greek philosophy, revealing many original quotations from lost works. Even more significant is the profound influence – uncovered in some of the chapters of this book – that they exert on later philosophy, Islamic and Western. Not only did they preserve anti-Aristotelian material which helped inspire Medieval and Renaissance science, but they present Aristotle in a form that made him acceptable to the Christian church. It is not Aristotle, but Aristotle transformed and embedded in the philosophy of the commentators that so often lies behind the views of later thinkers. 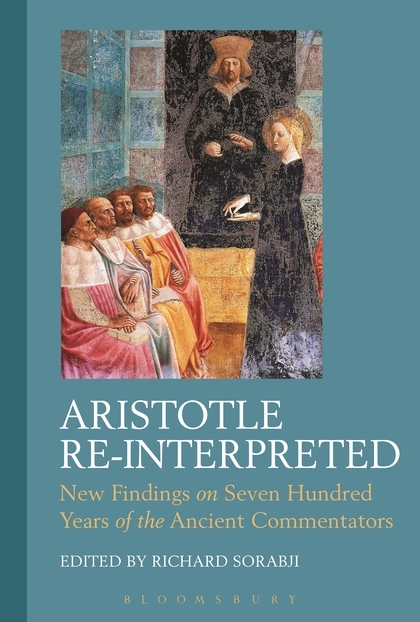 Also forthcoming is a new companion volume to Aristotle Transformed: Aristotle Re-Interpreted: New Findings on Seven Hundred Years of the Ancient Commentators. This volume presents collected essays – some brand new, some republished, and others newly translated – on the ancient commentators on Aristotle and showcases the leading research of the last three decades. Through the work and scholarship inspired by Richard Sorabji in his series of translations of the commentators started in the 1980s, these ancient texts have become a key field within ancient philosophy. Building on the strength of the series, which has been hailed as 'a scholarly marvel', 'a truly breath-taking achievement' and 'one of the great scholarly achievements of our time' and on the widely praised edited volume brought out in 1990 (Aristotle Transformed) this new book brings together critical new scholarship that is a must-read for any scholar in the field. With a wide range of contributors from across the globe, the articles look at the commentators themselves, discussing problems of analysis and interpretation that have arisen through close study of the texts. Richard Sorabji introduces the volume and himself contributes two new papers. A key recent area of research has been into the Arabic, Latin and Hebrew versions of texts, and several important essays look in depth at these. With all text translated and transliterated, the volume is accessible to readers without specialist knowledge of Greek or other languages, and should reach a wide audience across the disciplines of Philosophy, Classics and the study of ancient texts. We are pleased to announce a new volume currently in the final stages of production and due for publication in 2016. This is the second half of Michael Griffin’s translation of Olympiodorus on Plato’s First Alcibiades: Olympiodorus: On Plato First Alcibiades 10–28. Olympiodorus (AD c. 500–570), possibly the last non-Christian teacher of philosophy in Alexandria, delivered 28 lectures as an introduction to Plato. This volume translates lectures 10–28, following from the first nine lectures and a biography of the philosopher published in translation in a companion volume, Olympiodorus: Life of Plato and On Plato First Alcibiades 1–9 (Bloomsbury, 2014).